Please note, the Cyclades TES0067 is discontinued. For replacement or upgrade options, please contact your KVM Switches Online sales representative at 1-877-586-6654. The Cyclades-TS family of Console Servers provides you secure and reliable management of your network and servers from anywhere in the world. Available in many different port count models in a 1U form factor, the Cyclades TS800 (TES0067). Security features such as SSH v2, RADIUS authentication, IP filtering, and user access lists per port allow data center managers and system administrators to remotely manage the network and servers with greater control and peace of mind. 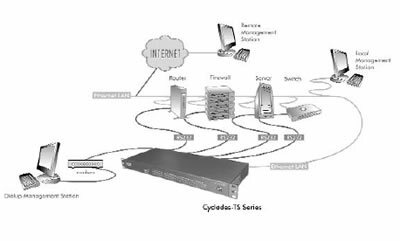 The Cyclades TS800 (TES0067) console management features such as data buffering, direct access methods to the serial ports (such as TCP port and server name) and event notification improve monitoring capabilities, allowing faster problem solving actions and higher network uptime. Instead of using proprietary software technologies, the Cyclades TS800 (TES0067) leverages on Open Source software (Linux), giving users the freedom to customize its operation, modifying or adding features as needed. The Cyclades-TS family of Console Servers decreases network maintenance costs while increasing efficiency and productivity. That's why the Cyclades TS800 (TES0067) is the right choice for secure in-band and out-of-band data center management.